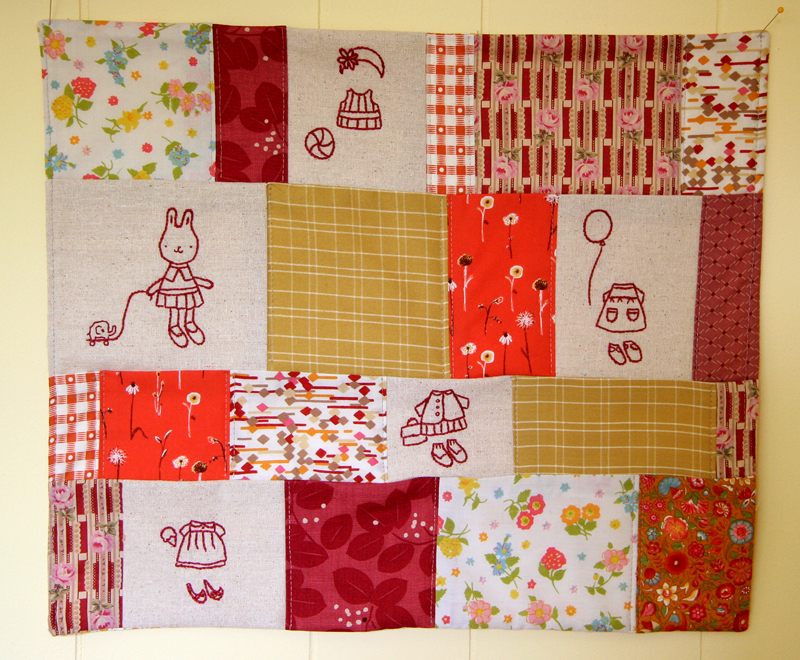 This doll quilt has been brought to you by the amazing phenomenon of… yard work! The exciting new activity around here that keeps both Tim and Oscar entertained for hours on end. It was heaven to sit in my craft room all weekend and putter while watching those two outside the window puttering in the backyard. We’ve become the putterers which is just how we’ve always wanted it. It was awesome to have a big chunk of time to work. I was able to sketch out the idea and start embroidering on Saturday and finish up on Sunday. I think this may be my favorite of the doll quilts I’ve made. I used all my favorite colors and fabrics and of course I’m a sucker for anything paper doll-y! I was helping a friend of my mother with some ideas for a redwork baby quilt and got inspired to try one out for myself. I like the missing persons. *HUGE GASP* That has got to be one of the cutest things you’ve done. Lucky Junebaby! So cute! By the way, did you see your Space Boy & Robot pattern book in this month’s Home Companion? It’s a blurb about Cut x Paste and doesn’t mention your name, but still… Congratulations! Sooooo cute! This is my favourite too. I love the little ice cream cone. And the shoes. Especially the shoes. Here’s another pattern you could sell. It’s darling. Squee! So precious! 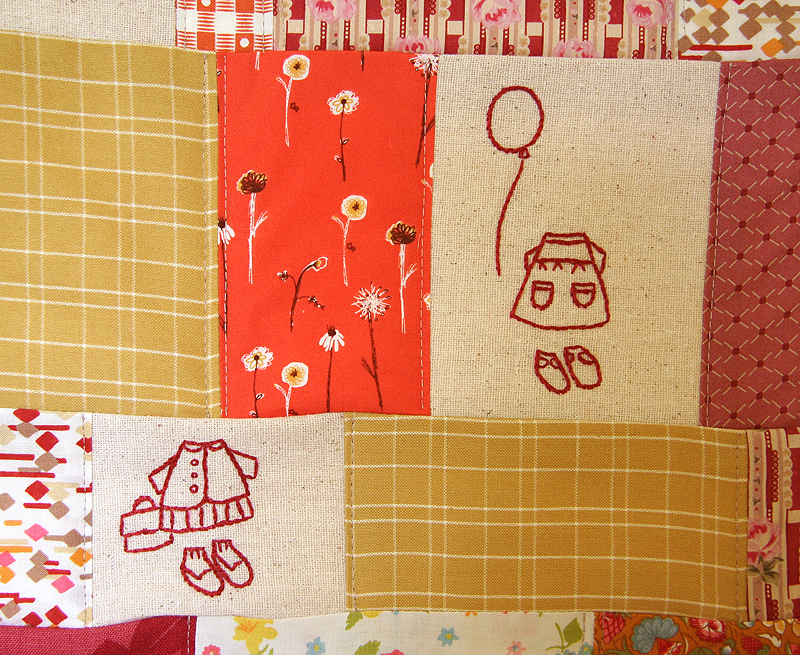 You’d better get ta hangin’ those cute quilts: June’s just around the corner. Junebaby is so lucky. There’s so much to see in that quilt with the embroidery and the fabulous fabric! And how lovely to have time to yourself in your craft room before the whirlwind of new baby life hits. Oh my gosh, it’s so perfectly cute, I can’t hardly stand it. How could one not love this one?! The colours and the compostition are beautiful and the dress-doll idea is just great and adorable! The bunny – the bunny -it’s too cute! It’s just a perfect doll quilt! I love everything about it! 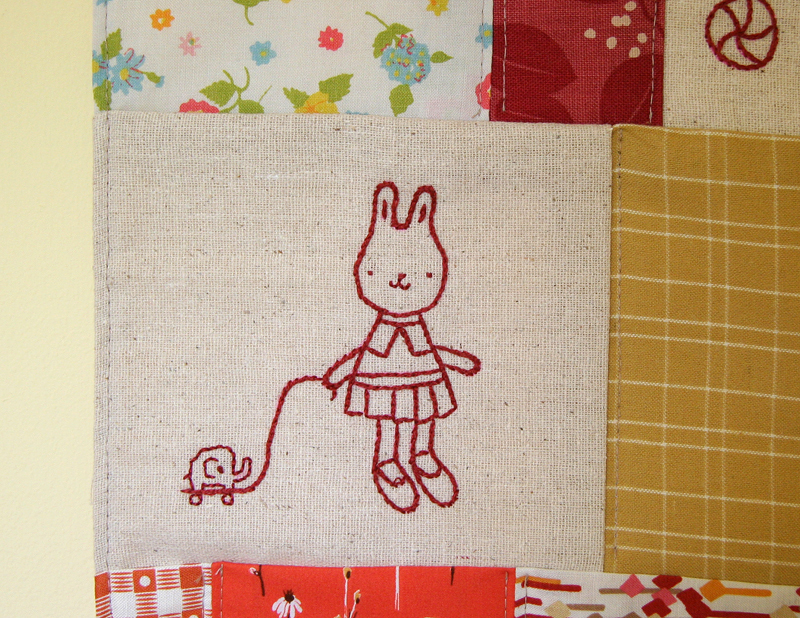 I like the bunny rabbit going out for a walk with her elephant. It is really sweet. She is smiling for the camera. Great work!! Have a great day! oh, i cannot stand it! i think i need to get one of those yards. so i can get some time off, you know? this is too sweet for words! This is the most wonderful idea you ever had (and all your other ideas and designs and patterns were already so beautiful..)! omgoodness!! soooooo much cute in such an itty bitty space!! it couldnt be cuter if you tried. 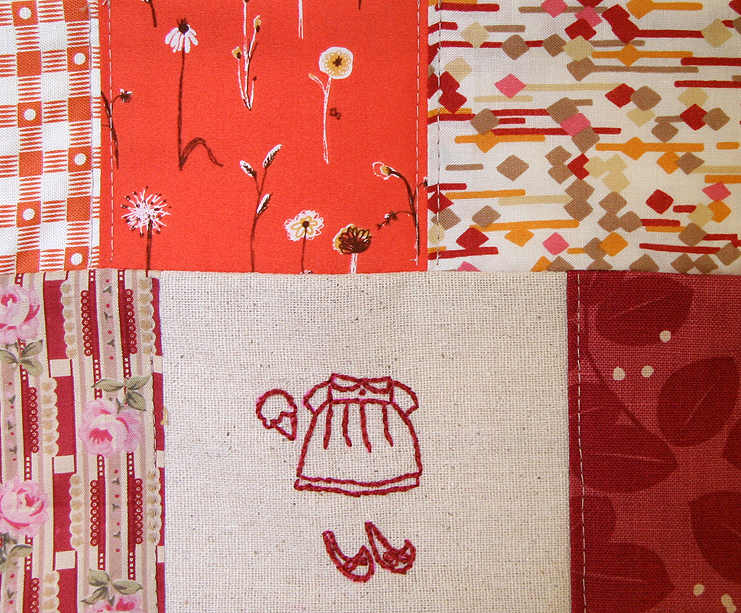 that orange heather ross flower fabric is one of my all time favorites. what a wonderful luxury- to begin a project and complete over the weekend! the quilt and its’ colors are perfect. Too cute!! I love it. You’d better be careful. That Junebaby will never want to leave her beautiful room! Even to go outside! 🙂 That is adorable, you talented chick, you! I really can’t wait to see these all hanging up together in the room. It’s beautiful, another completely original idea. love it. I just had my baby last month after moving cross-country to a new home a few months ago. I’m AMAZED at how much you’ve managed to do while pregnant. I haven’t even been able to get my studio in order, much less make much. sigh. Love your blog! So sweet! Love the embroidery and the colors. I’m working towards that myself. This quilt is absolutely adorable! I can’t wait to see what the room looks like with all the quilts hanging! I love the little outfits with the “invisible bunny”. Very cute quilt! How many do you have by now? I love that little bunny! So tell me are the quilts on the wall yet? Or are you saving that for after the baby? Gorgeous. The reds are so yummy. And I love that little bunny with her pull-along eleblump! I love paper dolls too. What a beautiful little quilt! The bunny is just adorable. Home Companion didn’t mention your name? Bastards! The quilt is awesome, as is all your stuff. I especially like the yellow fabric. oh, lovely loveliness. a weekend of puttering and creating sounds heavenly, and obviously produces wonderful results. Oh my gosh…. how adorable. This is so pretty. Love the combination of your hand stitches with the machine work. It goes well. Lisa – no sign of them here yet. We’ve been hunting for them. Anina – I’m not sure how many I have now. I think I need a few more for a really full wall. And nope, they’re not up yet. Don’t worry, I’ll post pics when I do it. And I think I’m going with the reader suggestion from last week to use little flat headed pins to nail the corners to the wall to hang them. The pins holding them up now are just temporary while I figure out where to put them all. Thanks to everyone who’s pointed out the Home Companion bit. There is a photo of the Robot & Spaceboy book which is very exciting. Big thanks to cutxpaste for submitting my patternbook to them for the piece!! What a great quilt! I love redwork and like how your work shows in redwork. You amaze me with all of that energy! All your little doll quilts look great. I can’t wait to see a photo of the finished wall. love the colours, i have a real soft spot for reds, although most of my work strangely ends up more pink orientated, but our house is definatley reds! This quilt is so beautiful! I found the book “Crafter’s Companion” when I was in London recently, it is really inspiring. That is absolutely adorable. I can’t wait to see the whole wall when they are all together. It is going to look amazing. Amazing! I love the little clothes embroideries. your work is incredible! your site is so inspiring. i just started my first quilt ever (it’s little – for my friend’s first baby) and your photos encourage me to try another soon! i think this is my favourite one too. the sweetness fo the redwork nearly kills me! Love the fabric choices and the embroidery! I am thinking the same thing there are lots of folks out here that love red work and your stichettes sell so well ever think of doing one with animals and in red work? I know I’d buy one. Oh, this is divine. I am in awe. I LOVE your quilts!! This is the first time I have visited your blog. I found you through Amy at the Calico Cat. Your baby’s room is just adorable. Congrats on the new addition to the family. I just packed one of mine up and moved her 2 states away for a job…kind of bittersweet. Enjoy this time.